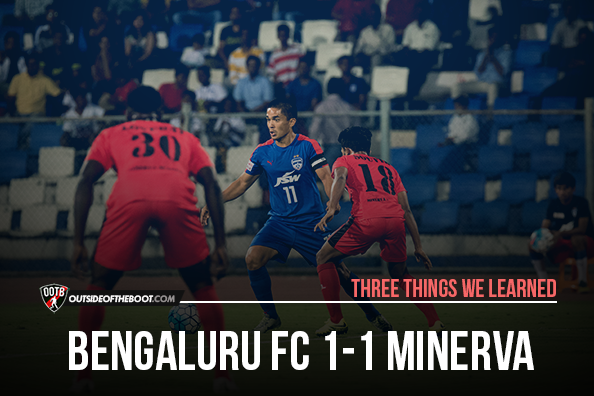 Arnab Ray discusses three talking points after Bengaluru FC’s 1-1 draw against Minerva Punjab FC in the I-League. After a convincing start to the campaign, Bengaluru’s form on the road left a lot to be desired as they crashed to defeats against East Bengal and Churchill Brothers before eking out a draw against DSK Shivajians. A return to the Sree Kanteerava Stadium against I-League newcomers Minerva Punjab was a chance for the Blues to get their title charge back on track. The away side though had secured their first ever league win and were intent on making life difficult for the Champions. Albert Roca’s men came into the game with just one point in the last three games with individual mistakes playing a large role in their slide down the table. Bengaluru were outplayed by East Bengal in the second half but the decisive goal of the game came when an uncharacteristic error from John Johnson was pounced upon by Robin Singh. The next game against Churchill Brothers saw the left-back Nishu Kumar heavily exposed with the Goan side making inroads into the defence on that flank. The trend continued at the Balewadi Stadium in Pune as DSK Shivajians’ Holicharan Narzary profited from a Keegan Pereira mistake to open the scoring. 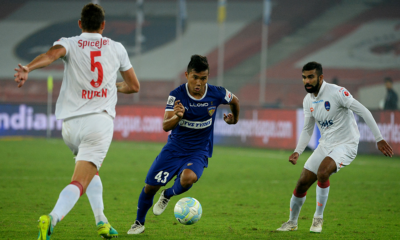 In the absence of the suspended duo of John Johnson and Juan Antonio, it was left to Sandesh Jhingan and Salam Ranjan Singh to marshall the backline. Truth be told, it was a comfortable game for the entire Bengaluru defence as they dominated possession with pressing from midfield successfully blunting the away side’s attack for most of the game. BFC looked all set to bag three important points ahead of the Kolkata derby before a familiar problem of late reared its ugly head again. With the Blues leading 1-0 and a little over ten minutes to go, a seemingly innocuous ball from Kamalpreet Singh saw Jhingan’s attempted clearance loop over a hapless Amrinder Singh and nestle into the back of the net. 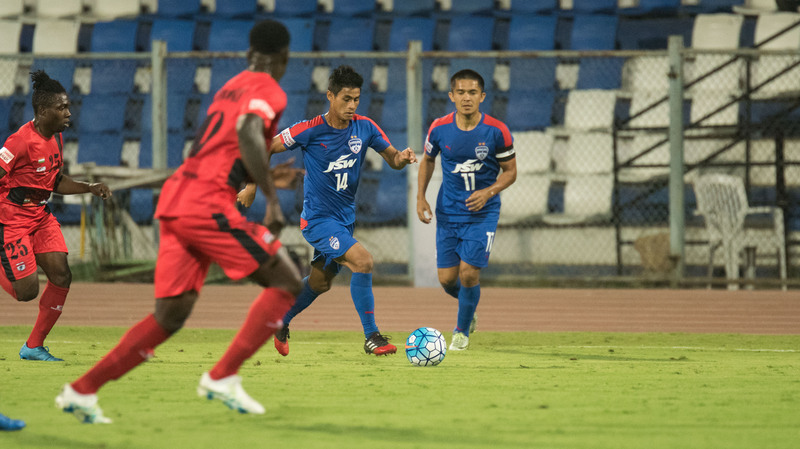 Luck seems to have deserted the Bengaluru outfit recently but the predicament they find themselves in is one largely of their own making. 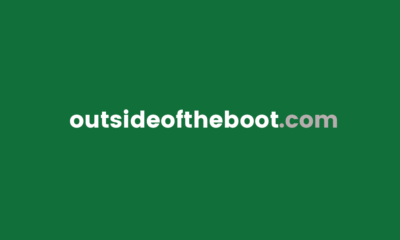 Thanks to the esteemed custodians of Indian football at the All India Football Federation, the country’s only recognized top flight league is ridiculously short and a run of bad results can prove disastrous to any side’s title aspirations. With just two points in the last 4 games, Roca’s men now have a mountain to climb to retain the tag of Champions of India. The Bengaluru skipper continued his fine goalscoring form as he found the back of the net yet again. In fact, on another day Chhetri could have well had a hat-trick to his name. The work that the Blues do on set-pieces is apparent as the variety of the routines on show is enough to keep any opposition defence on their toes. The absence of Johnson and Juanan saw Roca’s men turn to a number of well worked variations from the dead ball, including one that produced the first real chance of the game in the first half. Sena Ralte’s measured ball into the box from a free kick picked out Chhetri who had drifted away from the crowd. The 32-year-old’s sublime volley seemed destined for the back of the net but rebounded off the cross bar. It came as little surprise that it was Chhetri who delivered the first goal of the game as he latched on to a clearance on the edge of the box and slotted home a neat first time finish. Yet another set-piece variation towards the end of the game almost saw the skipper win the three points for his side. Putting aside the disappointment of the result, the game portrayed just why Sunil Chhetri is so revered by the West Block faithful. The fact is that he’s the most technically gifted footballer on the field on most occasions and yet his drive to win and perform is plain for all to see. A bottle sent flying near the dug out at the end of the game was a manifestation of the frustration he felt at two dropped points but on a personal note, it was a successful outing for Chhetri. As Bengaluru FC look to turn things around, they will look to their talisman to lead the charge once again. The focus of the Bengaluru attack was once again from the flanks with a considerable time of the warm up spent on crossing balls into the box with the likes of CK Vineeth and Chhetri the targets. This is understandable given that Minerva Punjab were expected to sit in a deep block and soak up any pressure that the home side exerted on them and the easiest way to break down a deep defence is to simply go around it rather than through it. 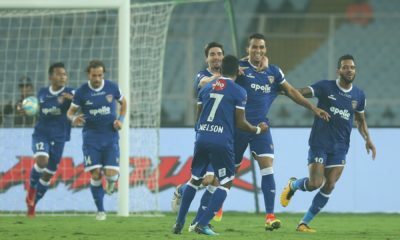 The tactics were vindicated to a certain extent as Chhetri’s goal was a result of some good wide play from Udanta Singh. Apart from set-pieces most of the Blues’ notable chances originated from the flanks. On the flip side, the attacking play down the middle has left a lot to be desired. Vineeth was deployed as the number 9 with Chhetri playing as a withdrawn striker and Eugeneson Lyngdoh on the left. With Lyngdoh’s propensity to drift in-field, one would expect the build up play through the centre to be quick and of high quality but that’s not been the case this season. The final ball has lacked quality which is especially disappointing since Vineeth’s movement and pace can be a potent weapon if the service is up to the mark. How much of this drop in creativity can be attributed to Lyngdoh’s lack of form is a question open to debate but there’s no denying that there’s a correlation. The Indian International has set a high standard for himself over the past couple of years and has just not got going this season. 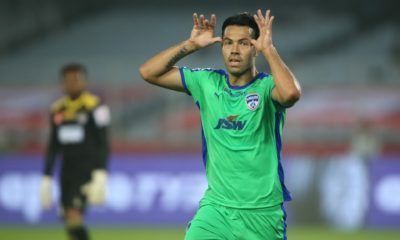 He was once again substituted on the night and will be looking to recapture the form from last season that saw him propel BFC to their second title in three years.